Are you trying to get pregnant? Have you just found out that you are pregnant? If so, you should definitely be in the market for the best prenatal vitamins. Prenatal vitamins are an amazing resource that we have to help ensure the healthy development of our babies during pregnancy as well as our own health during this time. Pregnancy can be very demanding on the body and it’s extremely difficult to ensure whole and complete nutrition through diet alone. That’s where prenatal vitamins come in. Prenatal vitamins are vitamins that are specifically formulated with pregnant women in mind. They address the needs of your body and your baby during pregnancy and help to ensure you receive more complete nutrition. Making sure your body has everything it needs during pregnancy helps ensure that your baby has exactly what he or she needs to properly develop and grow. It also plays an important role in ensuring that your body does not go without during this important time, which could negatively impact your own health. Do you want a chewable option, a gummy, or a pill to just swallow? Do you want to only have to take one a day or are you okay with having a larger serving size? How much can you afford to spend on a prenatal vitamin? Do you prefer a vegetarian or vegan option? Is an organic prenatal vitamin important to you? Now that you have a better idea of what type of prenatal vitamin you are looking for, we can talk about one of the most important things when it comes to choosing a prenatal vitamin – the actual contents. Prenatal Vitamin: What do you need when preparing for pregnancy? What should a prenatal vitamin have in it? There are some universal basics that all prenatal vitamins include. Things like Vitamins A, C, D3, and E are almost guaranteed to be in every prenatal vitamin on the market. You are also unlikely to find an option that doesn’t contain niacin, zinc, and copper. From there, though, the ingredients of different prenatal vitamins can vary wildly, and you’ll want to carefully consider what things you want most in your prenatal vitamin. So, to make it a little easier, we will go over a few of the other ingredients that you might want to check for in your prenatal vitamins. Iron is very important in pregnancy. It plays a critical role within your blood when it comes to carrying oxygen around throughout your body. Every part of your body requires consistent and constant oxygen for healthy function. The iron in your blood helps to transport the oxygen to all of the parts of your body. Iron becomes even more critical during pregnancy because it also helps transport oxygen to your baby. It can be difficult to get enough iron in your regular diet to properly support yourself and your baby, which is where supplementation comes in. Many prenatal vitamins do contain iron, but not all of them. Some leave it out because on over-abundance of iron can lead to digestive issues including upset stomach. If you choose a prenatal vitamin without iron, you need to ensure that you are getting adequate amounts of iron daily through tracking your diet and/or additional supplementation. Another thing that is absolutely vital during pregnancy but also hard to get enough of in your diet is folate or folic acid. You absolutely want your prenatal vitamin to have one of these in it. It shouldn’t be hard to do this because almost every single prenatal vitamin out there is going to have one of these. The reason it is so relevant to consider this during your search for the best pregnancy vitamins is because folate and folic acid are different from each other. The purpose of folate things during pregnancy is primarily to prevent neural tube defects and support healthy spine and neural development. However, folic acid is the synthetic form of folate and is often used in place of it. Folic acid is certainly beneficial but can be more difficult to absorb and therefore sometimes less effective overall. Consider folate VS folic acid when choosing a prenatal vitamin. DHA is the omega-3 fatty acid that is essential to brain development, especially for your baby during your pregnancy. It is a vital nutrient that you should definitely ensure you are getting while pregnant. Some prenatal vitamins contain DHA, but many do not. Choosing a prenatal vitamin with DHA is an easy way to ensure you are getting it daily, but if you choose one that doesn’t have it, you simply need to ensure you get it elsewhere. It’s almost impossible to get adequate amounts in your diet. This is especially true because of concerns about mercury in fish (best place to get DHA) and the dangers of that during pregnancy. Basically, if DHA is not in your prenatal vitamin, you should be taking a separate fish oil supplement to make up for it. Calcium is another very important nutrient needed for a healthy pregnancy and healthy baby. The good news is that it is generally easier to get more calcium from your diet and there are plenty of calcium-rich foods to choose from such as dairy products. If you do struggle to get enough calcium in your diet or you just want to be extra safe, choose a prenatal vitamin that does have calcium. It can give you an extra boost to make sure that your baby gets what they need for strong bones without your own bones becoming weak during your pregnancy. With how different each woman is and how different prenatal vitamins can be from one another, the best pregnancy vitamins for each woman is going to be different. To help narrow down your options and make it easy for you to find which prenatal vitamins are best for you, we have put together our list of recommendations for the top prenatal vitamins below. We were careful to include a good variety of options as well as ensure each option that we did choose is high-quality and highly beneficial for you and your baby. Here is our top pick for the best overall prenatal vitamins! These are Rainbow Light Prenatal One vitamins. This is a very high-quality brand that believes in creating safe and effective products. Their Prenatal One vitamins are no exception. There are a lot of different factors at play that led us to choose these as our best overall pick for our list of best pregnancy vitamins. There are plenty of reasons to love these vitamins, but something that really helps them stand out is the addition of superfood ingredients. These prenatal vitamins do a lot more than just provide the basics. They go a step beyond and add multiple items known as superfoods into their prenatal vitamin blend. What is a superfood? Many people may not be familiar with the term “superfood”. What it actually means is simply that the food item being referred to is particularly beneficial for health and densely packed with beneficial nutrients. Within these vitamins, you’ll find superfoods like red raspberry, ginger, and spirulina. Something really nice about the Rainbow Light prenatal vitamins that really helped to make them our pick for the best overall prenatal vitamin is the inclusion of probiotics. Probiotics are extremely beneficial for anyone and can certainly be very helpful during pregnancy. They help to aid in healthy digestion to ensure that you are getting the most out of the vitamins themselves as well as your normal diet. This can help increase absorption and therefore the benefit you and your baby receive from important nutrients that you are ingesting. Unfortunately, these are quite pricey as far as prenatal vitamins go. Keep in mind that most high-quality, more complete prenatal vitamins aren’t going to be super cheap. However, even compared to other good prenatal vitamins, these still cost a pretty penny. The fact that they contain probiotics really increases their value, though, and should also be considered when you are deciding if these are worth the cost for you or not. 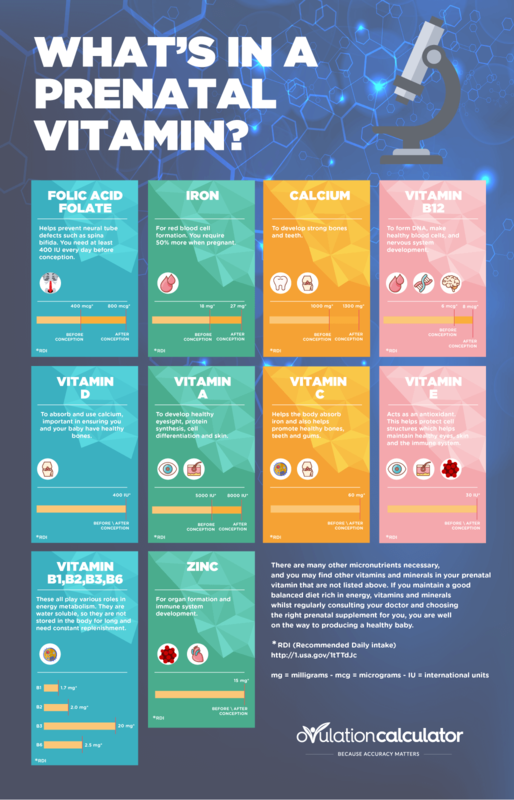 The price alone may knock these vitamins out of the considerations list for you, but if you are willing and able to spend a little more, these have some great benefits. The simple fact that the best overall prenatal vitamins actually contain probiotics really does increase the overall value of them. This way you can have both a great prenatal and a helpful probiotic all in one pill! From SmartyPants comes our favorite pick for the best prenatal vitamin with folate. We included this option, as well as a few others on our list of best prenatal vitamins, because we know there are expecting moms that are specifically looking for a great prenatal vitamin that contains folate rather than folic acid. We think these are the perfect pick and will be super beneficial to you and your baby! As we talked about in the prenatal vitamin buying guide, there is a difference between folate and folic acid. Folic acid has certainly been shown to have similar benefits and should not be entirely discounted. However, folate is the natural form, which is thought to be easier to absorb and works more effectively at preventing neural tube defects and aid in healthy spine and neural development. SmartyPants has chosen to go with the more natural form, folate. The folate in the SmartyPants Prenatal Complete vitamin comes in the form of methylfoalte, which is the active form of folate. This is in place of the synthetic form – folic acid, which is used in many other prenatal vitamins. There is one thing about these vitamins that can be seen as either a pro or a con depending on who you ask. That is that they are gummy vitamins with a recommendation to eat 6 gummies daily. Some women appreciate this because the gummies are actually super yummy and it’s easier on some women to eat gummies rather than swallow pills. However, some women do prefer to be one and done when it comes to their vitamins and having to eat 6 vitamins daily can be inconvenient in some cases. One special and very important component of these gummy prenatal vitamins is Omega-3 fish oil. This contains both EPA and DHA. Both of those are extremely important and beneficial to proper development of your unborn baby. EPA aids in important development like immune system and heart. DHA supports development of the brain, nervous system, and eyes. It is very difficult to get efficient amounts of these things through diet – especially considering there are safety concerns with eating fish during pregnancy. Quality is extremely important to those at SmartyPants and they have committed to having each batch of their vitamins independently tested by a 3rd party. This ensures that they have exactly what they say they have in them. That’s not all, though. They test them at each stage of production to really ensure the quality. Folic acid is definitely beneficial and helpful, but more women are starting to prefer to go with the more natural form of folate, methylfolate. This option from SmartyPants is definitely the best pregnancy vitamins with folate rather than folic acid. We love it for many reasons including the omega-3 fish oil and delicious gummies formula! These are certainly not the only gummies on our list, but they are our pick for the best prenatal gummy vitamins! These awesome gummy prenatals are from Vitafusion. They are an excellent choice, especially for anyone on a budget! That’s because they are also a really cheap prenatal vitamins option. The reason that these gummy vitamins are specifically our choice for the best prenatal gummy vitamins is because they are so incredibly affordable, and you only have to take 2 a day to get the recommended dose. This is a lot more convenient than the 6 you need to take with the SmartyPants vitamins. Although, some women may actually prefer taking 6 gummies daily since it’s kind of like an extra little treat. The price really makes the difference here, though. These Vitafusion prenatal vitamins come in at about a third of the cost daily compared to the SmartyPants gummies. That, on top of the fact that you do only need to take 2 a day, really sealed our decision to make these the best prenatal gummy vitamins. The big downside here is that these prenatal vitamins just don’t contain as many important nutrients as most of the options we chose for our prenatal vitamins guide. They have lots of good stuff – things like vitamins A, C, D, E, B12, B6, niacin, iodine, and zinc. They actually even have DHA omega-3 fatty acids, which is an incredibly beneficial bonus! One thing in particular that you may notice is missing from these Vitafusion prenatals is iron. Sometimes, companies choose to leave iron out because an excess of iron can be very rough on the stomach and gastrointestinal tract. However, iron is extremely beneficial and necessary to proper fetal development. So, unless you know for sure you are getting plenty in your diet, you want to supplement it during pregnancy. These prenatal gummy vitamins are super yummy and natural! The assorted flavors are all naturally derived and come in different yummy fruit flavors like orange! They aren’t just naturally-flavored, though. The best prenatal gummy vitamins are also free of artificial colors! If you are in need of a budget-friendly prenatal vitamin, Vitafusion can be the perfect choice. They are actually our pick for the best prenatal gummy vitamins for this reason as well as several others. Even as cheap prenatal vitamins, these are still high-quality with natural flavors and colors that taste delicious! One of the biggest problems with supplementing in general is that many supplements are harder for your body to absorb than naturally occurring vitamins and minerals within the things we eat and drink. So, seeking out a whole food prenatal vitamins option may be very beneficial when it comes to absorption and nutrition. What it means when we say “whole food prenatal vitamins” is simply that the nutrients within these vitamins actually come directly from real, raw, natural whole foods. There are several picks on our guide that are considered whole food vitamins, but our pick for the very best whole food prenatal vitamin is hands-down Garden of Life’s Vitamin Code Raw Prenatal. Garden of Life is a seriously incredible brand of super high-quality, natural products. Their vitamins are nearly unbeatable and easily made it into the best pregnancy vitamins guide a couple of times. These ones, specifically, are the best whole food prenatal vitamins. They are made with completely natural, raw, whole food ingredients that can be traced back to the source. The great thing about choosing these Garden of Life vitamins is that they are free of all the bad stuff that we have to watch out for in our products. This is a super clean formula. There are no artificial colors, flavors, sweeteners, colors, or chemicals. They are non-GMO and free of synthetic ingredients. One of the many raw whole food ingredients used to create these awesome vitamins is ginger! Ginger is a root that has many extraordinary purposes and benefits. One of those just happens to be easing morning sickness! So, while many prenatal vitamins have a tendency to make women feel a little sick, these ones actually combat that issue. The ginger doesn’t just help with morning sickness, but also helps aid digestion in general. The further addition of probiotics really increases the overall effectiveness. This is especially helpful since digestion is easily disturbed by the many changes our bodies undergo during pregnancy! One thing that you might not love so much about our pick for the best whole food prenatal vitamins is that you have to take 3 pills daily. This can definitely be inconvenient – especially if you happen to be more forgetful during pregnancy like I am. There are some benefits of taking 3 smaller doses throughout the day rather than one large dose, though. This helps absorption, further aids in digestion, reduces morning sickness, and spreads out energy benefits. Our top prenatal vitamin pick for the best prenatal vitamins with DHA is One a Day Women’s Prenatal 1! This is yet another great choice of prenatal vitamin that contains the incredible fatty acid known as DHA. That’ s far from its only benefit, though. There are plenty of other reasons to choose this as one of the best vitamins for pregnant women. So, obviously, the DHA is a huge reason that we adore these One a Day prenatals. DHA is an extremely important thing that you really want to make sure you get enough of during pregnancy. It is absolutely essential to the healthy development of your baby’s brain, eyes, and central nervous system. Getting a decent amount of DHA has been shown to clearly benefit babies in these ways and you really don’t want to miss out on it. This is another prenatal vitamin that keeps the formula clean by avoiding artificial sweeteners, colors, and flavors. It’s also free of common allergens like wheat and dairy. It contains lots of important nutrients to support pregnancy including folic acid, DHA, iron, calcium, iodine, magnesium, and many more. One a Day is proud to hold the title as the #1 doctor recommended prenatal vitamins brand. It can be very reassuring knowing that doctors agree that this is an amazing prenatal vitamin that will help to efficiently support your body and your baby throughout your pregnancy. One thing that can be a little unfortunate with these particular vitamins is that they may have a bit of a fishy smell to them. While this is not inherently harmful, it can be a major turn off for some. It can especially be an issue considering many pregnant women are more sensitive to smells in general. The reason that you can get this smell with these is because they are a one-a-day vitamin that contains DHA. DHA is derived from fish oil and since their full daily dose is concentrated into just one pill, the smell is more likely to come out. It is actually one of the many reasons that some brands choose to spread out a daily dose into 2 or more vitamins rather than putting it all into one. DHA is essential to healthy development of your baby. Choosing a prenatal vitamin with DHA is a great way to ensure you get a good amount of it daily to aid in your baby’s development. If you choose a vitamin without DHA, you need to make sure that you are getting it from another source such as an additional supplement specifically for DHA. These One a Day Women’s Prenatal Vitamins are an easy way to avoid having to take more than one pill a day, though. They are convenient and packed with good stuff for you and baby! Now here are some seriously impressive prenatal vitamins that we really just can’t say enough good things about. These are incredible in lots of different ways, but we specifically love that these are the best organic prenatal vitamins out there! The important thing here is that these are actually certified USDA organic prenatal vitamins. A lot of products out there call themselves organic just because they use one or two organic ingredients. With these, you can rest assured they are the real thing thanks to the USDA organic certification. There is so much to love about these that it’s hard to fit it all into one review. One major thing, though, is that they have a super clean formula. They take the time to carefully list all of their ingredients that you can easily read on the bottle. They have a vegan, gluten-free, dairy-free, soy-free, non-GMO, whole foods formula that is very difficult to beat. What is really nice, too, is that they took the time and resources necessary to actually get certified on their claims. That’s not just true for their USDA organic certification. They are certified gluten-free, verified by the non-GMO project, certified vegan, and even certified kosher. Something that’s really neat about these mykind Organics vitamins is that there is a full 9 organic fruits in each bottle. It’s really nice to know that the ingredients are so clean and yummy! Plus, they are gummy vitamins! An all fruit chew option is really nice and you don’t come by it super often. The price is definitely up there on these prenatal vitamins. What is actually surprising, though, is that they are not the most expensive choice that we reviewed. They are actually very affordable when you look at the fact that they have so many clean certifications, a whole foods formula, and are completely organic. If you are trying to stick to more organic choices, the best organic prenatal vitamins are an invaluable choice that is well-worth your purchase. They are a little pricey, but really not too bad overall and not even the most expensive option on our guide. They are super clean, delicious, and beneficial for you and your baby. This is a strongly recommended prenatal vitamins option on our guide! These are the best natural prenatal vitamins, which I know is exactly what a lot of women are looking for. Natural options tend to be better for you and more importantly, safer for you and your baby! So, these New Chapter Perfect Prenatal Vitamins are an amazing choice for most expecting moms! The coolest thing about the best natural prenatal vitamins is actually the inclusion of fermented foods and probiotics. The natural, whole foods that are included in these pregnancy vitamins actually make a big difference in your experience with them. Because of this, you can even take these on an empty stomach without worrying about becoming nausea. This is actually my favorite thing because I am one of the women that has struggled to find a prenatal vitamin that doesn’t make me sick. What is really special about the formula being gentle on your stomach is that these DO have iron in them! So, you can have the benefits of iron in your prenatal vitamins without worrying about how it will affect your stomach thanks to the fermented foods and probiotics. As people become more aware of health concerns, it is becoming more popular to avoid GMOs. As part of their aim to be as natural as possible, these New Chapter prenatal vitamins are completely free of GMOs. They even proudly display their verification from the non-GMO project to ease your mind that they are legitimately free of GMOs. Sadly, you can’t expect so much without paying for it. These New Chapter prenatal vitamins are one of the priciest options of all those that we reviewed. They won’t be the best pregnancy vitamins for everyone because of this. You also do have to take 3 of these daily to get a full dose. These awesome New Chapter Prenatal Vitamins are a wonderful natural prenatal vitamin choice. They are a little pricey, but many women believe it’s worth it. That can be especially true considering the inclusion of fermented foods and probiotics that really increase the overall value of the New Chapter Prenatal Vitamins. Many women ask the question of when to take prenatal vitamins. Taking prenatal vitamins before pregnancy can be extremely beneficial and is strongly recommended whenever possible. So, if you are trying to conceive or know that you may become pregnant, taking a vitamin beforehand can actually prove to be invaluable for you and your baby. If you are looking for the best vitamins before pregnancy, we love these CONCEPTION Fertility Prenatal vitamins that are actually designed specifically for that! These are one of the best prenatal vitamins before pregnancy for multiple reasons. They do help to boost your fertility and likelihood of conception. However, what we really love is how beneficial that they actually are to the baby you are hoping to soon conceive. These contain folate as methylfoalte rather than folic acid. Not only that, but they contain an impressive 800mcg of it! That’s actually double the minimum recommended dose during pregnancy and definitely more than what most of the prenatal vitamins out there have. The reason that it is so important to actually have this high amount of folate in your system before you become pregnant is because something like a neural tube defect would occur so early on in development, that it is perfectly likely you may not even know your pregnant before it happens. So, by preparing your body with high amounts of folate, you can actually more effectively prevent neural tube defects for your baby. The earlier you intaking adequate amounts of folate, the better your baby’s chances of avoiding these potentially devastating problems. These are called Fertility Prenatals for a reason! They contain lots of vital vitamins and minerals to help support your body and get you healthy for your pregnancy. They also contain an incredible fertility boosting blend specifically designed to get your cycle more regular along with your hormones. This helps to increase your chance of conception! So, if you are ready to make a baby, these are the perfect pregnancy vitamins for you to start out with! While this is not the only option when it comes to taking prenatal vitamins before pregnancy, it is definitely one of the best choices. The special fertility boosting blend as well as the high levels of folate as methylfolate are extremely beneficial pre-pregnancy. The downside is that these are not designed to be the most supportive option throughout the entirety of your pregnancy. If you do choose these, you will want to switch to different pregnancy vitamins after the end of your first trimester. If you’re looking for the best pregnancy vitamins, but you aren’t quite pregnant yet, these are for you! These are a really wonderful vitamin and fertility boosting blend to help you get in healthy shape before your pregnancy. They also help aid in increasing fertility for a greater chance of faster conception! Just remember to switch to another pregnancy vitamin around the end of your first trimester. Here comes the best vegan prenatal vitamins from NATURELO! There are a few vegan options that we actually included in our guide, but we really love these as the best vegan prenatal vitamins and believe you will too! Now, vegan options are vital for those that choose to live a vegan lifestyle. However, they aren’t only for vegans. Even if you don’t generally eat or live strictly vegan, these can still be a very clean and beneficial prenatal vitamin for you to choose. NATURELO is another wonderful brand and there is certainly a lot to love about these vegan prenatal vitamins. What is really important to recognize with these vitamins is that they are super high-quality. NATURELO chooses natural, plant-based ingredients over synthetic or low-quality options time after time. In these vitamins, you will find natural folate rather than folic acid, calcium derived from ocean algae rather than limestone, and vitamin C from organic cherries opposed to synthetic ascorbic acid. These natural choices may cost NATURELO more to use, but they are much better for you and more easily absorbed and used by your body for your health and your baby’s health. One of the great benefits to vegan options is that they tend to be cleaner and avoid more potentially harmful substances. This formula is very clean, not just because it is vegan, but for many other reasons as well. They choose to be wheat-free, soy-free, preservative-free, and non-GMO. All of these things come together to help you avoid potential health issues over time. Of course, since it does cost more to produce such a high-quality product with more natural options, the price does transfer to the cost of the vitamins. These are one of the most expensive choices of those that we reviewed. They are also another option that you have to take 3 capsules daily with. If you are a vegan looking for the best vegan prenatal vitamin, look no further! Even if you aren’t vegan, consider the many amazing benefits of these awesome pregnancy vitamins as they still could be the right choice for you! If you prefer to avoid gummy vitamins, but you don’t want to swallow a pill every day – worry not! The best chewable prenatal vitamins are here! These are BellyBar Chewable Prenatal Vitamins and are another great budget-friendly option for those that need a cheap prenatal vitamin. Finding the best chewable prenatal vitamins wasn’t the easiest job in the world, but once we came across Bellybar, we knew! Not all women are able to easily swallow pills and some prefer to avoid gummies. So, these chewable prenatal vitamins provide a great alternative. The good news is that these don’t sacrifice quality! These are safe and effective prenatal vitamins. The fact that they are easily chewable makes them super easy for your body to absorb and can ease any stomach you might typically have from taking a prenatal vitamin. They are naturally flavored like mixed fruit and are free of artificial flavors, colors, and preservatives. The great thing about these as a budget-friendly, cheap prenatal vitamins option is that you still get plenty of key nutrients even at the lower cost. These contain all the basics you would expect in a prenatal like vitamins A, C, D, E, niacin, zinc, and thiamin. Then they also contain important things like iron, calcium, and folic acid! They do a wonderful job at helping to support you and your baby throughout pregnancy. While some women do enjoy the natural mixed fruit flavor of these chewable prenatal vitamins, they aren’t for everyone. Even those that prefer a chewable vitamin may take some time to get used to the chalky texture and flavor of these vitamins. These chewable prenatal vitamins are great for lots of expecting moms. If you need something super affordable or are just looking for a pill and gummy alternative, these can definitely be the best pregnancy vitamins for you! In short, yes, prenatal vitamins should be considered a necessity for healthy pregnancy. It is almost impossible to ensure that you are getting every vitamin, mineral, and nutrient you need during pregnancy in healthy amounts daily. Prenatal vitamins are the best way to ensure that you get everything you need for a healthy pregnancy and healthy baby. Do prenatal vitamins make you fertile? Prenatal vitamins certainly do have the potential to increase fertility. If you are trying to conceive, it is a good idea to take one. This won’t just ensure that you are already getting what you need as soon as your baby is conceived. It will also increase your overall health, which certainly can increase chances of conception. Should prenatal vitamins be taken while breastfeeding? Yes, it is definitely a good idea to continue taking a prenatal vitamin for the duration of breastfeeding. During breastfeeding, your body is still supporting your baby. So, you need increased amounts of key nutrients that you can ensure you get through a prenatal vitamin. Who should take prenatal vitamins? All pregnant women should take a prenatal vitamin. Women that are trying to conceive or may become pregnant should also take a prenatal vitamin to ensure healthy nutrition from the start. This can help decrease potential birth defects. Finally, lactating women should also be taking a prenatal vitamin to continue to ensure that both their baby and their own body is getting all of the needed nutrients for optimal health and development. In conclusion, you’ll definitely want to find the best prenatal vitamins for you. They are so important and can really make a huge impact on the overall health of you and your baby. They don’t just have a positive impact during your pregnancy either. For your baby, they can make a big difference in the critical early development that will affect them for the rest of their lives. We hope our guide has made the decision a little bit easier for you!